The National Institute for Health and Care Excellence (NICE) provides guidance and advice to improve health and social care. The way NICE was established in legislation means that their guidance is officially England-only however, there are agreements to provide certain NICE products and services to Wales, Scotland and Northern Ireland. Decisions on how NICE guidance applies in these countries are made by the devolved administrations, who are often involved and consulted with in the development of NICE guidance. More information about NICE can be found on their website. NICE issued Quality Standards on Endometriosis in August 2018, aimed at ensuring the NICE Guidelines on Endometriosis are implemented. They comprise 3 quality statements, along with the impact they should have, what would need to be in place to ensure they were met, and how they can be measured. These are the first ever set of Quality Standards for Endometriosis and will be reviewed every two years, so as services improve the Quality Standards can also be developed to address other areas. Three quality statements were developed (see below), with the aim of improving diagnosis and ensuring prompt and appropriate referral to secondary care – including being very clear that those diagnosed with or susptected to have deep endometriosis (eg affecting the bowel or bladder) are referred directly to a specialist endometriosis centre. For successful implementation, all medical practitioners who might come into contact with women who could have endometriosis - GPs and practices nurses, school health services, sexual health clinics, and emergency departments - will have to know the signs and symptoms on endometriosis, which would be a great step forward in improving diagnosis and support. Statement 1 Women presenting with suspected endometriosis have an abdominal and, if appropriate, a pelvic examination. Statement 2 Women are referred to a gynaecology service if initial hormonal treatment for endometriosis is not effective, not tolerated or contraindicated. Statement 3 Women with suspected or confirmed deep endometriosis involving the bowel, bladder or ureter are referred to a specialist endometriosis service. How can I use these to help with diagnosis? being referred by your GP directly to a gynaecologist if you have endometriosis or symptoms and are trying to conceive. being referred by your GP to a gynaecologist if the initial hormonal treatment your GP tries does not work within 6 months. 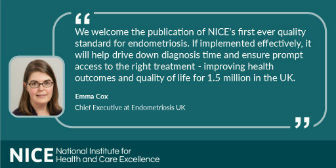 NICE – the National Institute for Health and Care Excellence - issued a new guideline on endometriosis in September 2017. The guideline, Endometriosis: diagnosis and management, covers diagnosing and managing endometriosis and aims to raise awareness of the symptoms of endometriosis, and to provide clear advice on what action to take when women with signs and symptoms first present in healthcare settings. It also provides advice on the range of treatments available. Produced to improve care and care pathways in the NHS, they can also be used by patients to understand what to expect with the treatment and management of endometriosis.